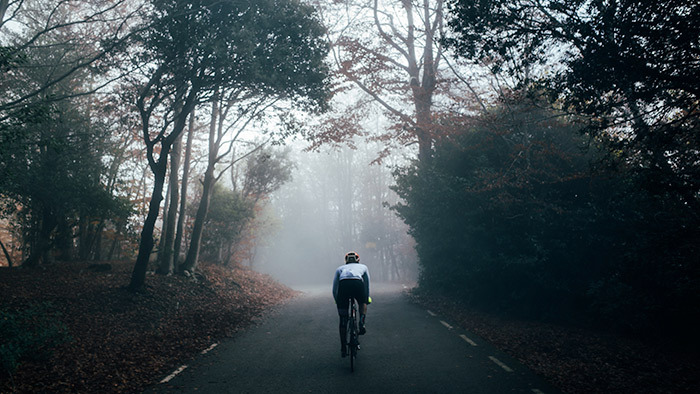 Winter is the most important phase of training for cyclists; it is pivotal to prepare the body’s aerobic system to build a base to prevent fatigue come mid-season. If periodized correctly, you can ensure your base protects you from whatever the racing season will throw at you. Base training is the name given to the training that teaches your body to utilize oxygen as efficiently as possible. Base training rides are typically long and steady, undertaken at a moderate intensity, which allows your body to make the necessary adaptations. Winter, therefore, is the perfect time to build your base. If coupled correctly with specific efforts, utilizing the correct energy systems will guarantee success post-Christmas. It’s a good idea to always kick-start your next phase of training with an aerobic assessment test, such as the 20-minute FTP test (functional threshold power). This ensures specific training zones going forward and helps optimize success throughout your training. Typically winter training starts on the first of October for most but this may differ depending on your “A” race next year. I would always recommend a solid foundation of three to four months of aerobic foundation work pre-race season. However, this needn’t be boring; mix it up and enjoy your cycling, going out with friends, long club rides and most importantly the odd effort to keep your heart guessing is pivotal to your success! Repeat five times, or this can be extended or shortened to reach the desired effect. Michael is the head coach and founder of Bikestrong UK. He is a physiology obsessed TrainingPeaks guru who is always looking for that extra edge; both with mental and physical performance marginal gains. Michael mentors coaches and athletes worldwide. He has worked with many established athletes and teams bringing home national medals. Michael manages a team of elite riders and coaches alike with more than 15 years of experience in the industry.